Hannah was married to an Israelite man, a Levite named Elkanah. In those days God allowed men to have more than one wife and often there were bad feelings among the wives. This was the case in Elkanah's family. His other wife, Peninnah had children, but Hannah had no children. She was so sad and desperately wanted to have a child. She even refused to eat. Peninnah provoked and aggravated her all the time and made her life miserable. Every year the family went to Shiloh to worship. Elkanah saw Hannah crying and refusing to eat and he spoke to her gently and tried to comfort her. Hannah got up and went to the tabernacle by herself to worship the Lord. She prayed and asked Him to give her a son. She said if He would give her this child she would make a vow to give him back to the Lord and no razor would ever cut his hair. This was called the Nazarite vow. Hannah was praying silently and her lips were moving, but no sound was coming from her mouth. 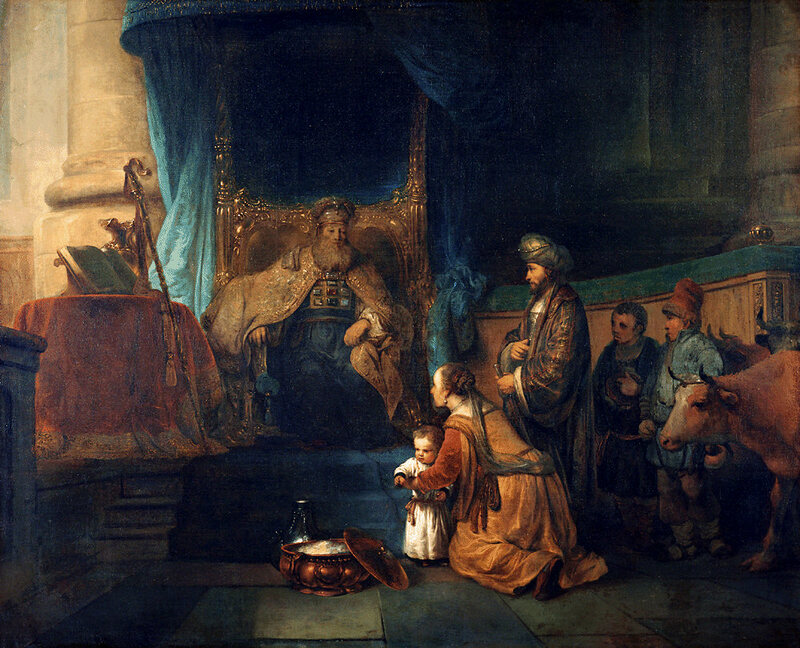 Eli, the high priest and judge, when he saw her doing this, thought she had been drinking alchohol and was drunk. He confronted her about it and told her to put away the wine. She told him she was not drunk, but was sorrowful and pouring out her heart to the Lord. After she told him her story he understood what was happening. He told her to go in peace because the Lord was going to answer her prayer and give her a child. Hannah believed the words of the priest Eli. She was a changed person. No longer was she sad. She was a happy, joyful person because she knew in her heart that she would have a son just as the priest had said. She began to eat her meals. If Peninnah taunted her or made fun of her it made no difference because she knew she also would soon be a mother. The family returned to their home in Ramah and in time Hannah did have a baby boy. She named him Samuel, a word which means "heard by God". God had heard her prayer and answered it. When it came time for the family to go to Shiloh the next year to worship, Hannah stayed home with her young son. She said, "Not until the child is weaned; then I will take him, that he may appear before the Lord and remain there forever." 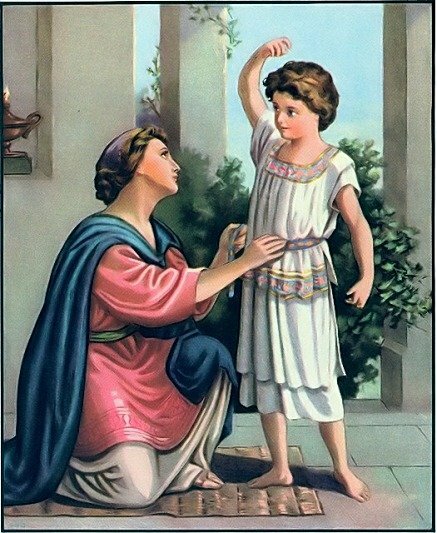 Later when Samuel was a little older his mother took him with her to worship. She also took sacrifices to offer. When she saw Eli she told him she was the woman who had prayed there earlier. 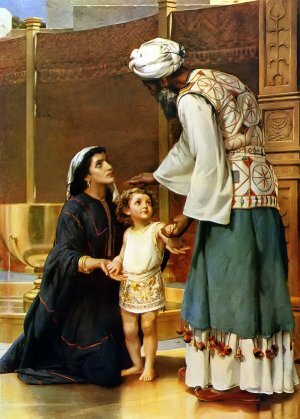 She left Samuel at the tabernacle to be raised by Eli the priest. Samuel would be dedicated to the Lord all his life. She kept her promise to return him to Shiloh to serve the Lord. While Samuel was in Shiloh ministering to the Lord Hannah did not forget about her child. Oh no, he was on her mind all the time, and every year as he grew taller and taller she came back and brought him a robe that would be just the right size for him. God also blessed her with MORE children. She and Elkanah had three more sons and two daughters. We learn from Hannah the value of persistence in prayer. Hannah did not give up. She continued to pray. God will not withhold anything which would be good for us. Sometimes we cannot determine what would be best for us, but God knows. Jesus said if a child asks a father for bread he will not be given a stone, and if he asks for fish he will not be given a snake. God is our father and He will give good things to those who ask Him. We also see the dedication and unselfishness of Hannah when she returned her young son to the service of God. We must be generous with the things God gives us and willing to share with others and let those things be used for God's glory. English Bible Activities Select story #70 in the list for activities to accompany this Bible story. Spanish Bible Activities Select story #70 in the list for activities to accompany this Bible story. Press "Go" to search for books about Hannah. THIS STORY WAS PLAN AND EASY TO READ AND UNDERSTAND. This page displayed 129,395 times.